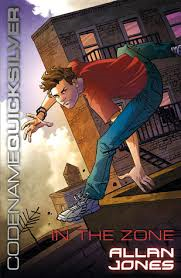 It's a conglomeration of mystery and action. The ends tie up just enough, while leaving a hint of uncertainty that leaves me wanting more. Isn't this what mysteries are supposed to do? 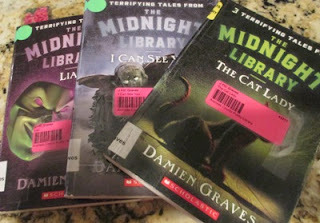 On our last book romp we stumbled on The Midnight Library series, by Damien Graves. 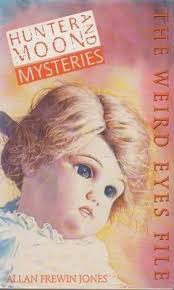 I'd classify these children's short stories as tween or early teen horror fiction. In fact my ten year old is wrapped up in The Midnight Library #5: Liar. And books are not the only thing she's wrapped up in. Notice The sling! When I picked her up from school last week, she wasn't moving her shoulder and was in a bit of pain She never complains, so I knew something was wrong. Not to mention it looked different from the other shoulder. 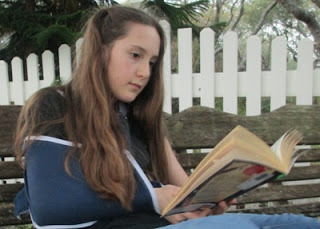 A trip to the hospital confirmed a fractured collarbone. Luckily no surgery, but going to be a long time without the use of her right arm. Activities for a one armed fourth grader? Until then, the Amazon book fairy will be delivering. My one armed reader picked one from the different alias names.